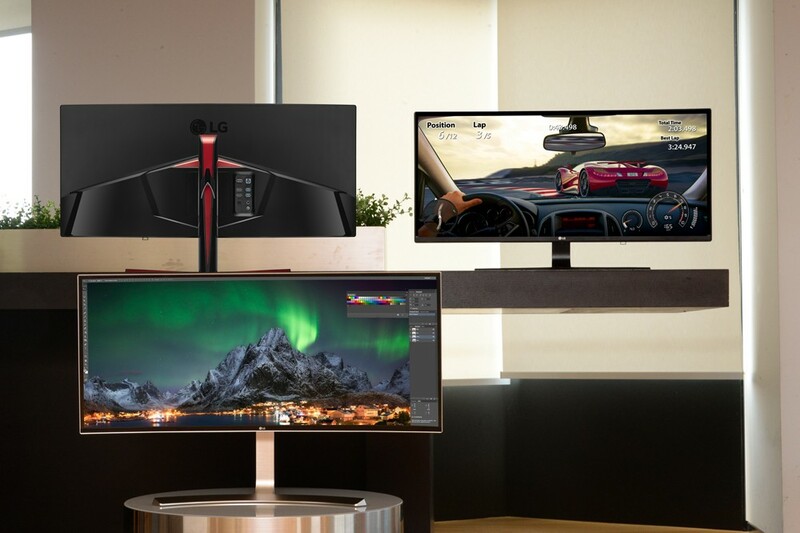 SEOUL, Aug. 30, 2016 — LG Electronics (LG), the industry leader in wide 21:9 aspect monitors for three consecutive years, is prepared to unveil two new 21:9 UltraWideTM monitors at IFA 2016 in Berlin. The 38-inch UltraWideTM curved monitor (model 38UC99) and 144Hz IPS 21:9 Curved UltraWideTM gaming monitor (34UC79G) represent significant advances in display innovation. Both monitors boast classic features that LG’s 21:9 UltraWideTM monitors have become famous for, such as wide field of view, vivid color rendering as well as ease of usability. Offering unrivaled screen real-estate, model 38UC99 is ideal for tasks that require attention to details. In addition to its roomy design, this monitor’s advanced IPS UltraWide QHD+ (3840 x 1600) resolution and wide color gamut covering 99 percent of the sRGB color space make the 38UC99 a natural choice for anyone who takes visual performance seriously. The monitor boasts crystal clear immersive picture quality alongside a number of convenience enhancing features, creating an unparalleled user experience. These factors make the 38UC99 the perfect workstation monitor for visual content creators, data crunchers and other multitasking professionals. As the first UltraWide™ monitor to feature a USB Type-CTM port, the 38UC99 offers a peek at the future of connectivity. The advanced port allows users to transmit content and data as well as charge another device such as a smartphone or laptop at the same time, all with single code helping eliminate clutter. The monitor also includes capabilities to customize display options with just a few clicks of the mouse and store customized color settings with the easy-to-use Onscreen Control software and My Display Preset. And the 38UC99 is just as suitable for entertainment as it is for workplace efficiency. With two 10W built-in Bluetooth compatible speakers, the 38UC99 offers Rich Bass audio output in the 85Hz bass range. This impressive audio system improves the entire user experience with its deep, rich sound. The one millisecond Motion Blur Reduction feature streamlines gameplay by minimizing afterimages that often occur in fast-paced games. As the world’s first 144Hz IPS 21:9 Curved UltraWide TM gaming monitor, the 34UC79G combines a blindingly fast refresh rate with advanced one millisecond Motion Blur Reduction. The monitor boasts seamless image transitions without annoying afterimages and the IPS display delivers accurate color expression from any angle without distortion. With features such as Black Stabilizer and Dynamic Action Sync, the 34UC79G is specifically designed to meet the needs of today’s gamers. Black Stabilizer provides extra clear contrast, allowing viewers to detect darker objects hidden in hard to see areas. Dynamic Action Sync reduces input lag so that users can enjoy fast-paced gameplay without any delays. What’s more, the inclusion of AMD FreeSyncTM offers smooth gameplay without any stuttering or screen tearing. The monitor also offers a crosshair option which adds a fixed target to the center of the screen to increase accuracy during FPS games and a mouse line hook to prevent drag resistance caused by the mouse’s cable. With the monitor’s curved shape and immersive 21:9 aspect ratio, the 34UC79G presents a world-class gaming experience for fans of FPS, RTS or MMORPG. 34UC79G also includes a number of practical design features fit well into gaming station setup without hindering gaming such as tilting, adjusting the height and the mouse line hook which minimizes tangled cords. Visitors to the LG booth (Hall 18) at IFA 2016 will be able to experience LG’s new 21:9 UltraWideTMmonitors for themselves from September 2-7.